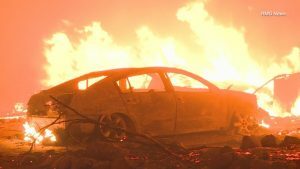 MALIBU, Calif. (NBC News) – At least five people are dead and tens of thousands have been forced from their homes after two California wildfires exploded in size overnight and into Friday. At least three major wildfires are burning, hundreds of miles apart. The gusting Santa Ana winds are helping fuel the flames. The town of Paradise, roughly 180 miles northeast of San Franciso, is a near total loss. “A considerable portion of the town was destroyed,” Cal Fire’s Robert Foxworthy confirmed Friday. The five confirmed deaths occurred there. The Butte County Sheriff’s Office says all five burned to death in their cars as they tried to escape the flames. Nearly 500 miles south, the beachfront town of Malibu was evacuated as flames closed in.